Note: I started writing this last month to capture a lot of different conversations I had at British HCI (and which I think everyone else was having too). Long before I bothered to finish it, John Vines distributed offical notes from the town hall meeting, which are much more complete and well worth reading. But they don’t have an anecdote about Greg Abowd. 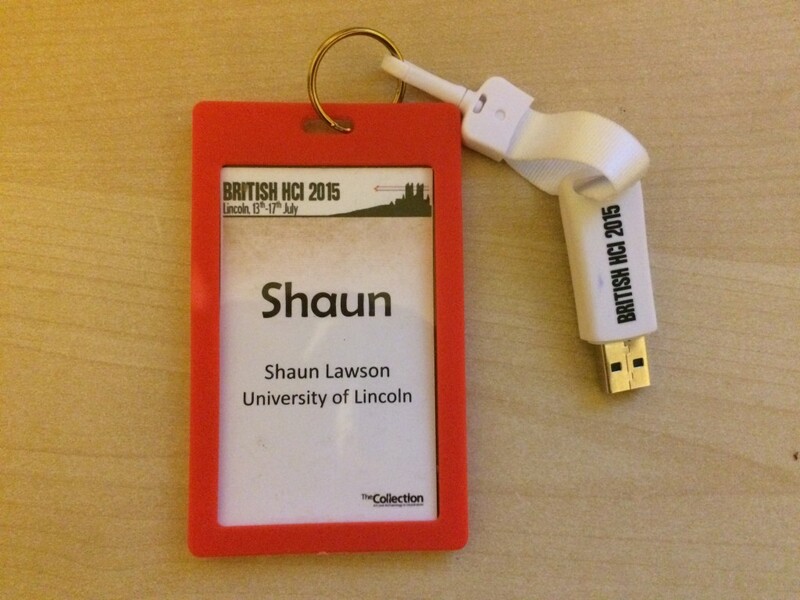 British HCI was the first conference I attended as a Masters student in 2007 (I didn’t talk to anyone). I attended again in 2011 when it was held in Newcastle, but last month in Lincoln was the first time I’d been when it wasn’t within walking distance of my flat. I think it’s fair to say that the conference is not held in high regard—or at the very least that it has failed in recent years to attract a significant chunk of the HCI community. If I remember rightly, Greg Abowd’s closing keynote in 2011 was itself less than complementary. This year’s conference, hosted by LiSC, openly sought to reenergise the conference. I don’t think anyone who attended would deny that they achieved it. What struck me most was that the papers were the least interesting thing on the program. The ~28 full papers were dwarfed by by position papers and invited talks, panels on the REF, designing with data and civic engagement, a research council lunch for early career researchers, an unconference lunch and no less than four keynotes (all from outside HCI). In particular, everything I heard about the doctoral consortium was glowing—some 50 students in a workshop that actively engaged them, rather than half a dozen presenting their work to each other. Back in 2011, I’m pretty sure Greg Abowd’s point was “stop trying to be a shadow of CHI”. While some regional conferences have managed to make this work and carve out a niche (NordiCHI, for example), this was clearly not working for the UK. At the time, it wasn’t clear what else the conference should try to be. After this year’s conference, I think it’s becoming evident. What should British HCI be? What HCI in the UK really needs is better networking on home soil. It’s insane that there are many people in the community that I may only ever see abroad. For whatever reason, British HCI wasn’t bringing people together, and I’ve often thought that the annual Digital Economy conferences were better networking opportunities (particularly given that the largest HCI groups were holding big Digital Economy money and were somewhat obliged to attend or host). Notably, Digital Economy papers aren’t archival. Making the rest of the program so interesting allowed the organisers to drop the pretence that the papers are important. Instead, they were able to treat the conference as an event to bring people together, share what we’re doing and discuss hot topics. As a result, it had a very different (and better) feel. But you can’t fix everything at once. Cost remains an issue—at £600 plus meals, it still wasn’t exactly cheap for an early career researcher with no budget. There is only so much you can do about this, but it’s something that the organisers will need to take into account. Heavily subsidising PhD attendees and providing very cheap accommodation was a positive step and allowed us to send some of our students. This sort of thing should be a minimum requirement for anyone who wants to host it. It’s also tangled up in the issue of who should champion HCI in the UK. Like the conference itself, BCS’s Interaction Specialist Group (which normally endorses the conference, but this year did not) has been marked by a lack of engagement with much of the HCI community, particularly the groups that have emerged as powerhouses in recent years. In the town hall meeting, I pointed out that SICSA is already doing an admirable job in Scotland of many of the things we might want a UK HCI body to do—mainly networking, but also showing leadership on key themes, engaging with industry and funding activities. That said, Scotland has a number of properties that makes this much easier: most of the research groups are clustered within an hour or two’s travel and SICSA is backed up by funding from SFC. Scaling this kind of activity UK-wide might be tricky, but it’s certainly worth looking at what they’re doing. The meeting didn’t reach a firm conclusion and it’s an ongoing discussion that we need to keep having. Likewise, the conference needs to keep innovating. 2015 doesn’t necessarily need to be the template for future conferences (in fact I’d argue that the distinct local flavour was to its benefit), but it should be a positive example. I don’t know if I’ll attend next year (you couldn’t get much further from Dundee than Bournemouth), but I hope some of the momentum is carried over. PS. I don’t fully remember how I ended up with this, but I hope it didn’t cause any problems for the closing plenary. Whoops! This entry was posted in Conferences and tagged British HCI by Nick Taylor. Bookmark the permalink.